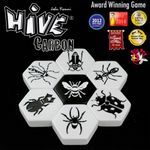 "Hive Carbon" (not "Hive Pocket") edition. Edition: English/French edition 2015. As pictured. Game: Excellent condition - plastic pieces are practically indestructible. Box: N/A - only tiles and bag. Other: Received from previous owner in sale.